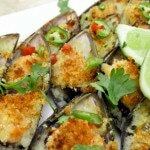 Baked Mussels | Mexican Appetizers and More! There are a dime a dozen baked mussels recipes on the internet today and they are all really quite simple to make from Japanese style baked mussels, cheese and mayo baked mussels, garlic butter baked mussels, baked mussels with sweet chili mayo topping and the list goes on! These baked mussels are made with a blend of olive oil, garlic and white wine topped with a sliver of a serrano pepper. Sound simple enough right?! Well it is! A great appetizer or a great mexican appetizer does not have to be complicated or a complex thing. Sometimes the simplest appetizers are the most delicious and even more inviting to make when you realize you just have to take a few steps to make it. 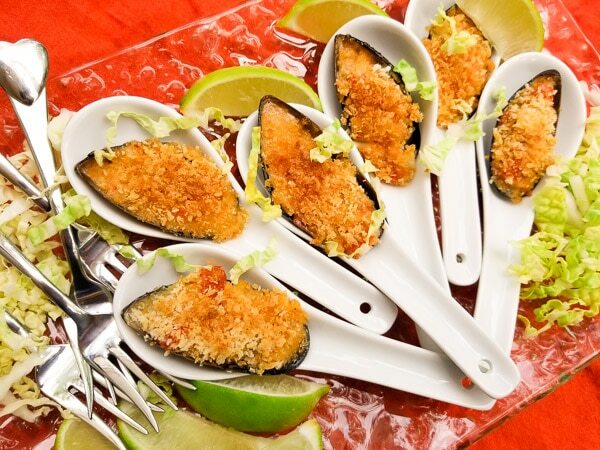 BTW, the sliver of the serrano pepper slice on top of each mussel is what makes this simple appetizer delectable. When you eat it, it awes you at the very end with an explosive pleasant surprise of heat that compliments this small morsel. It’s genius, truthfully! A few of us out there get a little overwhelmed with the idea of how to make mussels and how to prepare mussels. Cleaning mussels can also be a challenge for some people. 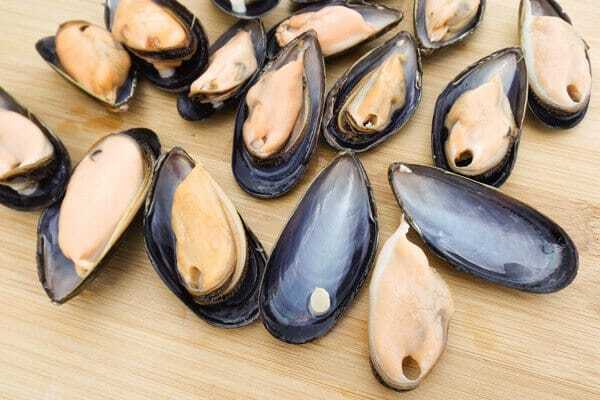 I’m here to let you know that, one, cleaning mussels is not a tortuous step and quite simple actually and two, this recipe is super easy and simple to prepare. When you buy live mussels from the fish market, sometimes you have to scrap the “barnacles” that attach themselves on the shells or you may have to scrub them a little to get the algae grime off. You may also see a “beard” that has to be pulled off. Or you may see a mussel slightly opened. If that’s the case, just tap the mussel and if it starts to close on its own, it’s still alive and good to eat. If it does not close, discard. Discard any crushed shells as well because these are dead. Fortunately for us, nowadays, mussels are grown on ropes and therefore do not really get barnacles, or grime and close rather quickly to the touch if slightly opened. Here is a video for you to watch by seafood expert Rick Stein. It’s 4 minutes and 29 seconds long but you only need to watch 2 minutes and 40 seconds to understand how to clean mussels. The rest of the video is on how to steam mussels open which would also be good for you to watch if you don’t know how to. For this recipe you will need to steam them open. Remove mussel meat from tendon so when cooked they are easier to eat. Place mussel meat back in shell. Rinse the mussels under cold running water and pull off any beards. Note: Discard any mussels that are opened and do not close when tapped. Also discard any crush shells. These are dead mussels. 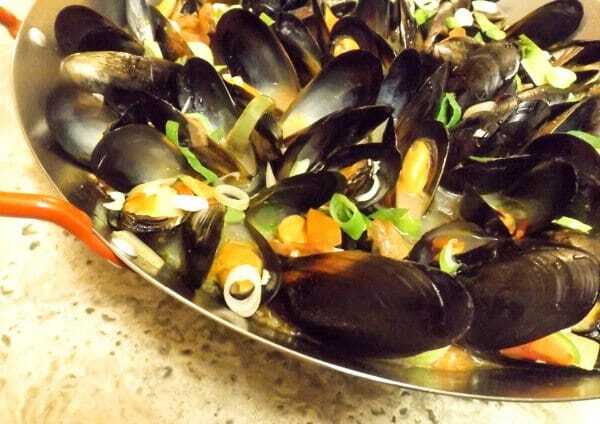 Add mussels to a large pan with about a cup of water over high heat. Bring to a boil. Cover pan with a lid. Shake pan occasionally until mussels open. About 2 to 3 minutes. Discard any that do not open. Let cool for a few minutes. Remove one side of each shell. 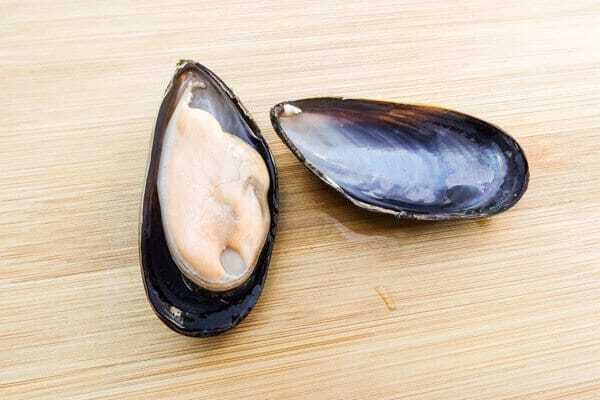 Gently disconnect mussel from the other shell (adductor muscle) so its easier to eat them. Lay mussel morsel back in shell. Set all mussels on a baking tray. With your hands, tear up bread slices into smaller pieces. Add pieces to a blender or chopper. Blend until they become bread crumbs. 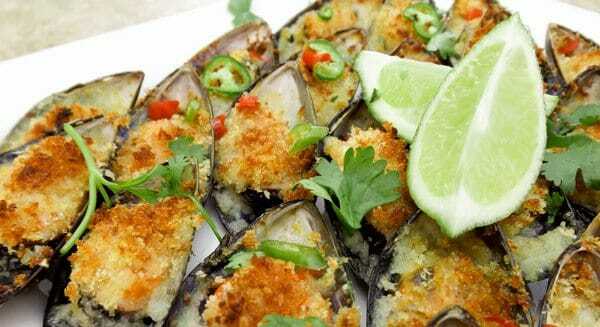 Top mussels with bread crumbs. Add garlic and oil to a blender. Blend until garlic is finely blended into oil. Pour into a small bowl and add wine. Mix together. Add about a tablespoon of garlic mixture to each mussel. Add a thin slice of the serrano pepper to each mussel to top. Place in oven and broil until mussels have crispy brown tops about 10 minutes. Serve with lemon or lime wedges. Enjoy! 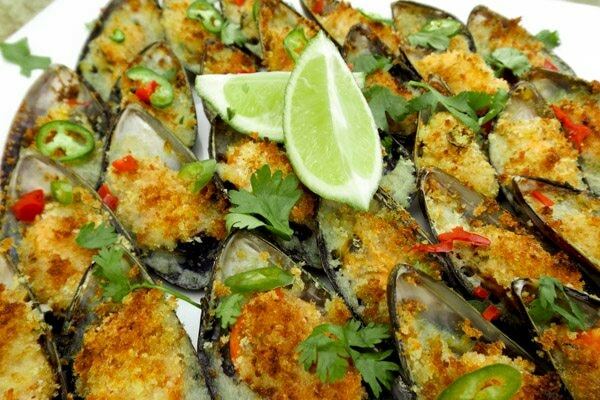 Will you be making these fantastic baked mussels this weekend?